China’s stock market slumped by 14.3% in July after dropping some 30% in June, which sent jitters among Aussie and Kiwi forex traders since a significant portion of Australia and New Zealand’s commodity exports go to China. But is the underlying economy really doing that bad? According to the report released by the National Bureau of Statistics of China (NBS), Chinese Q2 2015 GDP somehow grew by 1.7% quarter-on-quarter (1.4% previous) and 7.0% year-on-year (7.0% previous), which means that the People’s Bank of China (PBOC) is still on target. The economic expansion was apparently due to a 6.1% increase in the wholesale and retail trade component, a solid 6.0% climb in the industrial sector, and an amazing 17.4% growth in the financial sector brought about the by the most recent stimulus package. In a separate report, it was shown that investment in fixed assets only grew by 11.4% in the first half of 2015, which is slower than Q1’s 13.5% growth. In addition, investments by state holding enterprises rose by 12.3% while investments from the private sector, which accounted for around 65.1% of total investments, increased by 11.4%. Investments in real estate development also saw a slower 4.6% increase in Q2 (8.5% previous). In the same report, China’s trade balance, saw a surplus of $46.54 billion in June 2015, which is less than the previous month’s $59.5 billion surplus, but better than the June 2014’s 31.8 billion surplus. More importantly, China’s exports finally saw a 2.1% year-on-year increase after three consecutive months of declines. China’s imports, meanwhile, declined by 6.7% after declining by 18.1% in May. 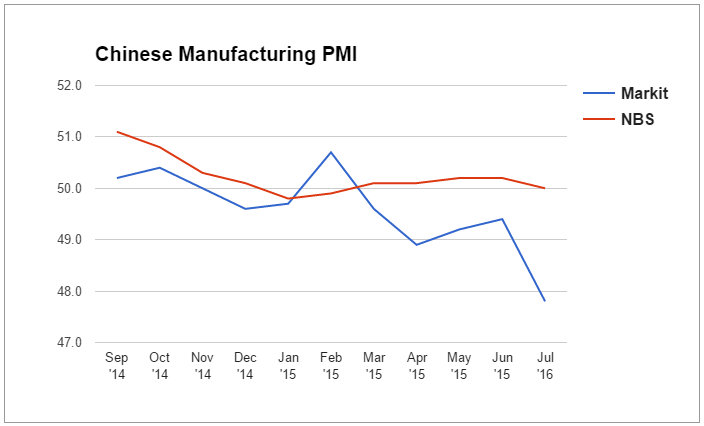 Markit’s reading for China’s manufacturing PMI indicated further deterioration in July (47.8 current v.s. 49.4 previous) brought about by the 21st consecutive month of declines in employment levels and the third consecutive month of contraction in production levels. According to Markit’s report, the continued weakness in China’s manufacturing sector was brought about by further declines in domestic and overseas demand for Chinese goods. The official manufacturing PMI data issued by the NBS begs to disagree, however, since it reported that July’s manufacturing PMI is sitting right smack on the 50.0 mark, which means that the manufacturing sector did not see any net growth nor did it see any contraction. Going through the details of the NBS report, the major components performed as follows: the production index declined by 0.5 to 52.4; the new orders index declined by 0.2 to 49.4; the employment level index ticked lower by 0.1 to 48.0; and the raw materials index decreased by 0.3 to 48.4. Moving along, China’s industrial production in June expanded by a respectable 6.8% year-on-year (6.1% previous), and it also looks like the manufacturing sector was leading the charge with a 7.7% increase year-on-year while the mining and energy sectors only grew by 2.7% and 2.1% respectively. June’s consumer price index (CPI) climbed by 1.4% year-on-year, but was unchanged on a month-on-month basis. The primary driver for year-on-year growth was a 3.5% increase for tobacco and liquor products, followed by a 2.9% increase in the cost of clothing. Healthcare and food prices also climbed by 1.9% apiece. The main drag was the 1.5% decline in the cost of transportation and communication services due to a 13.7% slump in the cost of fuels and vehicle parts. Overall all, consumer inflation seems to be well-supported by steady domestic demand. As for June’s producer price index (PPI), it slid by 0.4% month-on-month and 4.8% year-on-year. Digging around in the report, it looks like the main drags are all related to the commodity industry: producer prices in the coal mining industry declined by 15.4% year-on-year; the petroleum extraction industry suffered a massive 32.4% decline; and the iron-ore mining industry got slapped with a painful 20.1% decline. Scanning through the report, it becomes apparent that producer prices in most industries were retreating or stagnant. The only industries which saw very slight increases were the tobacco and cigarette manufacturers (+0.5%), clothing manufacturers (+0.7%), medicine manufacturers (+0.5%), and water distributors (2.5%). That’s it. The rest were in the red or stagnant. Well, aside from the PPI data, China’s economy seems suspiciously healthy. The fact that Markit’s PMI reading and the officially-sanctioned NBS reading are greatly diverging is one thing, but it also seems like a number of forex traders and economists are beginning to question the most recent GDP reading as well. But even if the official data are indeed accurate, they still don’t fully reflect the ripple effect from the recent stock market meltdown, which is why some forex traders and economists are already calling for a slowdown in the upcoming economic reports. If a slowdown does occur or if it is later revealed that China has been overstating its data, then we can probably expect forex traders to exert some bearish pressure on the Aussie and the Kiwi due to their dependence on commodity exports to China.